Devon Cliffs Holiday park is located in Devon-Sandy Bay Exmouth. We live in Bristol so it was an easy journey for us. We took the M5 from Bristol to Exeter then theA379/A376 exit toward Dawlish/Exeter/Sidmouth/Exmouth. Total journey: Less than 2 hours. The Holiday park is situated on a cliff, and you will be delighted by the beautiful panoramic view to the Channel. 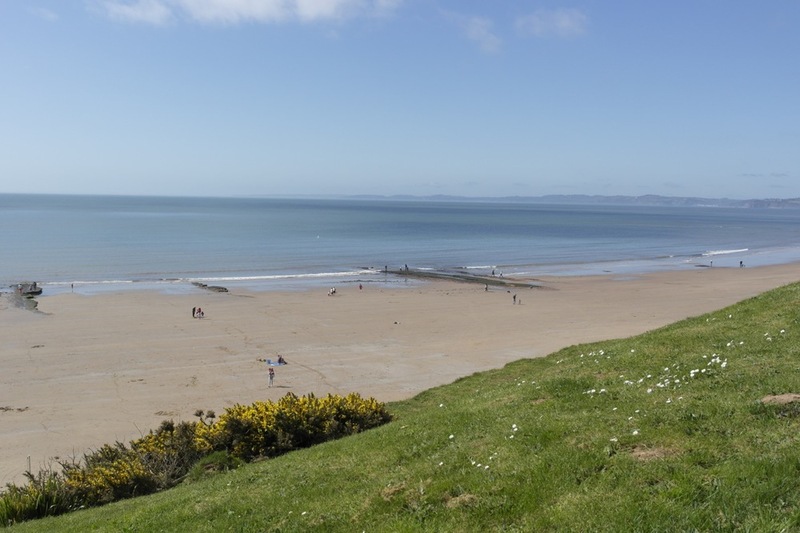 There is a stunning beach 'Sandy Bay', which has easy access from the Holiday Park. Let's put it this way: The location is fantastic and it deserves a 10/10! Haven Holiday Devon Cliff - First impressions. I worked in the Tourism industry in Spain, and I only have one word to qualify this Haven Holiday Park: BIG. This place is huge, and you can easily imagine how busy it can be during the Summer Holidays. The reception is located in the main center of the Park. This is where you also have the restaurants, entertainment, SPA, supermarket, and Starbucks! (I love Starbucks :)) On Check-in day, this place is extremely busy, but I have to admit that check-in was fast, friendly and efficient. The reception team are very good at explaining where your static caravan is because believe me it is extremely easy to get lost in this BIG holiday park. We booked a "Superior" Static Caravan (3 bedrooms). The cleanliness was not to a great standard but apart from that the accommodation was nice, perfect for our little family and we had a stunning view to the Channel. We were not far either from the Entertainment Centre/ Indoor Pool and the Beach. Please note that some static caravans are very old and I wouldn't recommend anything below "Superior". We had great weather (End of April 2013) but the nights were very cold and we didn't have heaters in the bedrooms. So whatever you do, don't forget an extra duvet, especially for your children. There is a heater in the lounge, it does the job but it is not powerful enough to heat the entire caravan. Cooking facilities were fine, and overall we had a great time. There is also a mini golf course, and a nice park with slides etc.... This is a family holiday and the most important is to have the kids happy, and they really had a good time. We also spent one day on the beach and it was excellent. This beach is big, clean and it's a kid's paradise. Apparently there is daytime entertainment, but I have to be honest with you we didn't see anything going on during the day. But with the indoor pool, the beach, the outdoor pool (summer), all the games in the bar/restaurant area you don't have time to get bored. Evening entertainment is really family oriented. The evening bar was extremely busy with kids everywhere dancing with the Haven Mascots. Our kids had a great time, and I have to say that the entertainment was great and if you want to have a good time with your children, you won't be disappointed. On holiday you always expect to pay more for almost everything. We were pleasantly surprised to see that the on site supermarket (SPAR) was not overpriced, and there was a good selection of foods. Starbucks had regular prices and we enjoyed our daily dose of caffeine! We had some take away foods from the restaurants such as the Fish and Chips (delicious by the way!) and to be honest prices were really good. Would we come back and recommend Haven Devon Cliff Holiday Park? YES and YES again. We loved the place, and the kids keep asking us to go back! It is located in a beautiful place, and the entertainment provided is great for the family. Bearing in mind we were there at the end of April and the place was already quite busy, I can only imagine how much busier it must be during the Summer Holidays, and in that case perhaps the experience won't be as enjoyable. Devon is a beautiful place, and we can't wait to go back to Devon Cliffs! If you have any queries about the Holiday Park, or if you have been before, I can't wait to read your comments. Many thanks, and if you find this review useful, you can spread the word. We came back to Devon Cliffs Haven Holidays in April 2015 for the Easter holidays. Guess what? The place was very busy but we had a fantastic time. The check-in process was a bit slow because there were hundreds of customers like us waiting to enjoy a great holiday. To be honest the team at the reception were very fast and efficient. We stayed in a beautiful caravan with beautiful views to the sea. This time my children were a bit older and ready to enjoy the week at Devon Cliffs. This time the holiday resort was very busy, but everything was clean and tidy. We were very pleased to see that most of the entertainment team was still the same. Nerea, Izan and Scarlett really enjoyed the evening shows, the party games and dancing on the dance floor. During the day there are plenty of things to do: great inside pool, beautiful beach (when weather is appropriate! ), trampolines, soft play and the enormous games area. To be honest it is difficult to get bored at Devon Cliffs. As our children are older, we didn't spend so much time at the Starbucks though! Overall we are very pleased with our second time at Devon Cliffs. In many ways it was much better than the first time. I can't fault this place and absolutely recommend it to everybody. If you want an outstanding, entertaining and fun holiday in Devon this is the place to go! We loved our Haven Holiday so much that on Monday 24th of August we are going to Norfolk Caister-on-Sea Holiday Park . We are all very excited and will publish a full review as soon as we come back!